Louis E. Chesner O.D (San Diego) - Book Appointment Online! 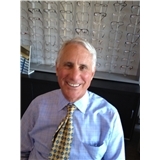 Dr. Chesner graduated from Colby College with a BA in Business Administration and received his Doctor of Optometry degree from Illinois College of Optometry. He has been practicing at the same location for over thirty years, and is known to be very caring and personable with his patients. He is therapeutically certified to treat many eye diseases and is constantly taking continuing education courses to remain on the cutting edge of his field. Computerized examination instruments, including retinal cameras, are used along with personalized care to ensure thorough and accurate examinations. Our office staff will assist you in choosing from the hundreds of stylish frames that we have on display. Dr. Chesner is a proud and involved member of the community. He has been married for over thirty years and is the father of 2 sons, Jonathan and Michael. He is also an avid, but frustrated golfer. Friendly, direct, no frills, and accommodating staff.